LCDR Michael “Pyscho” McLeod, USN (Ret) adjusts the FJ-4B Fury model during its installation in the Cold War Gallery. The first thing visitors see when they walk through the doors of the Navy Museum’s Cold War Gallery is the massive Trident I C-4 Missile. Looking left, an impressive glass case sits right next to the Ready Room Theater. The case houses a wide array of 1:48 scale models of aircraft developed and flown during the Cold War era. Once complete, this collection will include nearly forty models that highlight the history and achievements of modern naval aviation. 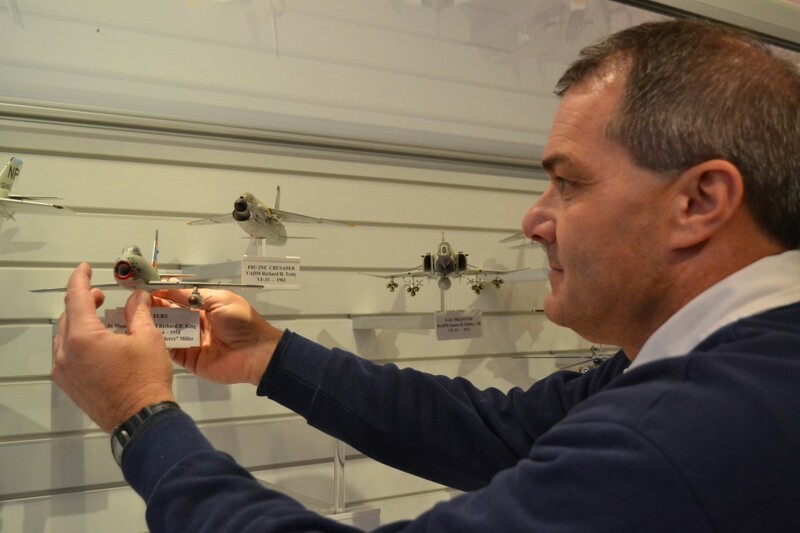 World-class model builder and retired naval aviator LCDR Michael “Psycho” McLeod recently added four new aircraft models to the case. All of the models were researched, designed, and built by McLeod. NHF volunteer Captain Ted Bronson, USN (Ret), the coordinator of this aircraft model project, was also on hand to help “Psycho” organize and place the models into the case. “Psycho” is extremely humble about the craftsmanship of his long time hobby. The Satellite Beach, Florida resident and Delta Airlines pilot works hard to ensure every iota of detail is included with each aircraft, often with little photographic evidence. The level of care taken to construct the scaled planes is impressive, even for the unassuming visitor. Enthusiasts of history and model making will marvel at his ingenuity for years to come. McLeod wants to be clear: he does not build toys. He builds MODELS. In part, they are much more than that. Most military models, like tanks and ships, represent a specific series or class of machines manufactured in times of war and peace. Most planes in any Revell model kit are exactly the same. What makes McLeod’s models so significant and unique are the touches of personalization. Like the pilots that flew them years ago, there is a unique story to every aircraft in the model case. Each model is individually matched to the man or woman that sponsored or dedicated the plane to be built by “Psycho.” It is the men and women that fly the planes, not the planes itself, that make the story. He is not only making models, he is making miniature monuments. The most recognizable of the four planes added last month is the F-11F Tiger, dedicated in honor of Captain Robert L. Rasmussen. The plane is painted in the likeness of Captain Rasmussen’s plane during his 1956 tour with the flight demonstration squadron, the Blue Angels. 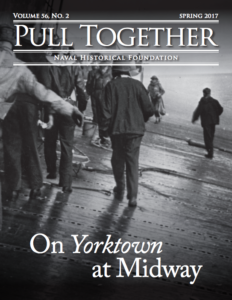 It was sponsored by RADM Bill Gureck, who was the Blue Angel PAO during this time. 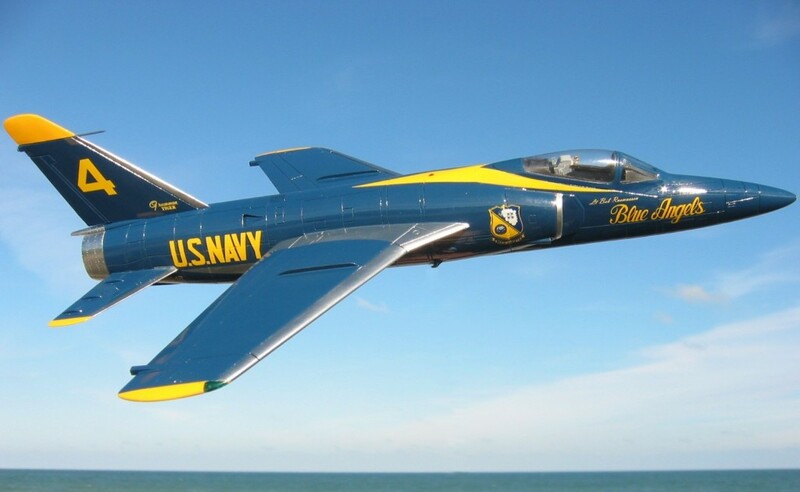 The Blue Angels flew the Grumman Tiger for approximately 12 years. Prior to his tour with the Blue Angels, Captain Rasmussen flew F-8 Crusaders. 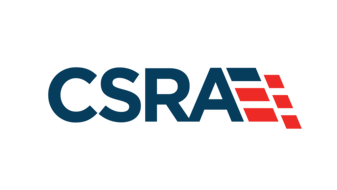 A long time friend to the arts and education world, Rasmussen serves as the director of the National Naval Aviation Museum in Pensacola, Florida. The F7U-3 Cutlass, sponsored by RADM James M. “mac” Gleim is by far the most unusual and short-lived aircraft. RADM Gleim flew the plane with the VA-34 “Blue Blasters” in 1956. The version he flew, the F7U-3, is considered the best version of its various prototypes. The plane was seen as a mechanical blunder for the Navy, as several of its test pilots and pilots died while in the cockpit of the aircraft. The Navy produced 192 of the F7U-3 type in the early to mid 1950s. 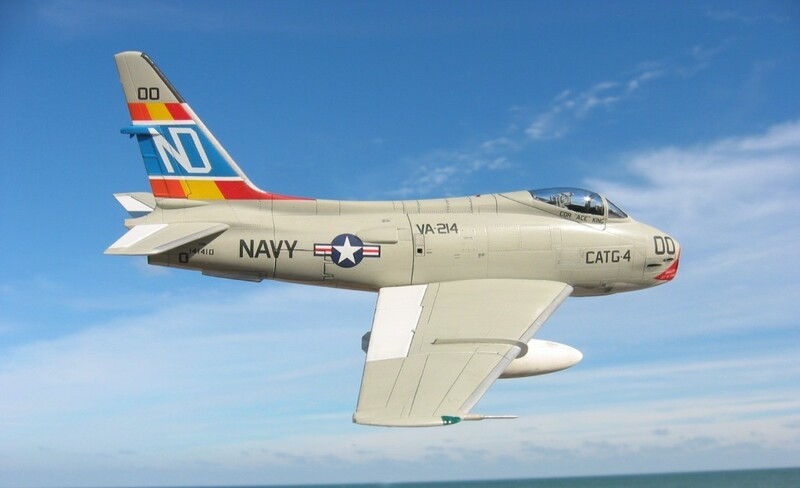 The FJ-4B Fury sponsored by VADM Jerry Miller was created in honor of LCDR Richard King. King was the skipper of VA-214 (“Volunteers”) in the mid 1950s. The Fury is a very distinctive aircraft. The specific FJ-4 Fury single seat model is a fast fighter-bomber powered by a 7,700 lb. turbojet engine. The Navy and Marine Corps used Fury aircraft extensively during its service in the 1950s and 1960s. 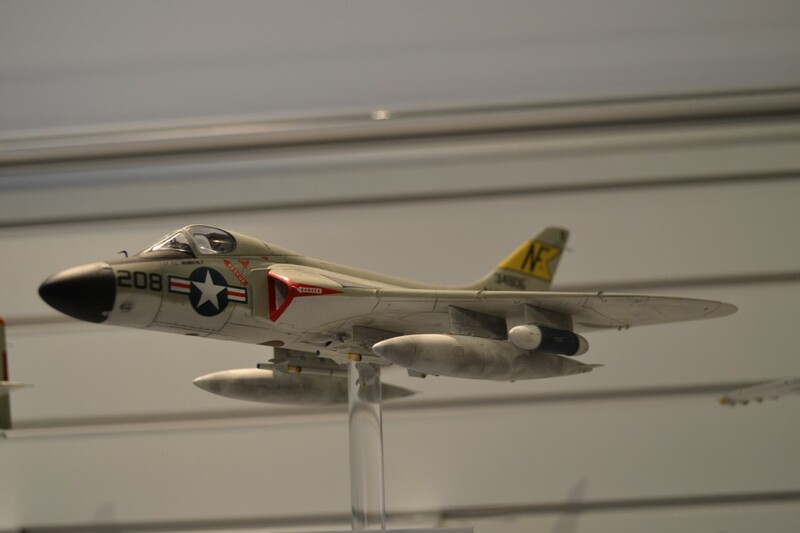 The final model, the F4D-1 Skyray, is sponsored by Captain Thomas Wimberly. During 1957, Wimberly and his Skyray flew with VF-141 aboard the USS Bonhomme Richard (CVA-31). Captain Wimberly, among other career accomplishments, was the XO of VF-74 (“Be-Devilers”) flying F-4 Phantoms during the 1967 fire aboard the USS Forrestal (CV-59). “Psycho” McLeod conducted extensive research to make sure the Skyray was set to its 1956-1957 specifications. Special thanks to LCDR McLeod for his hard work and dedication in making these models. 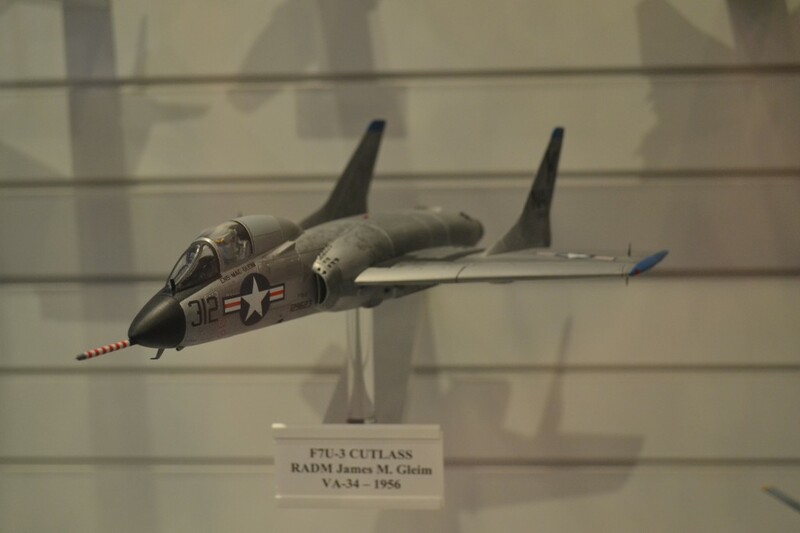 Visit the “Fly Navy” page of the Cold War Gallery website to see photos of the other aircraft models now on display. Would like to get in touch with Mike McLeod. He built a model of the screwtop for the Forrestal. One of the names on the plane is my father. Thank you for your response. His email is mcleodpilot@cfl.rr.com.